You’ll also need to know the following stitches: Magic Ring, single crochet (sc), double crochet (dc), one stitch increase (1 inc), one stitch decrease (1 dec), chain (ch) and slip stitch (sl). 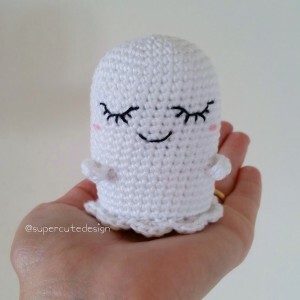 The ghost is crocheted in the round, with the addition of ruffles at the bottom. You’ll also be making tiny hands that will be sewn on later. 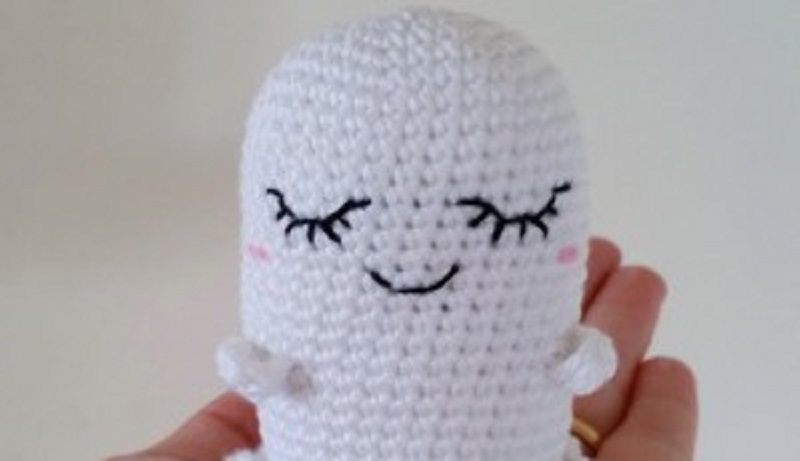 After the ghost is assembled, you’ll need to embroider sleepy little eyes and pink cheeks. These would make perfect little additions for a kawaii Halloween party or someone’s ghoulish collection of creepy cute amigurumis. If you’d like the free pattern, you can find it at the Super Cute Designs website in English, with U.S. crochet terms.